OmniGrants is a sophisticated and intelligent online grants management system created to innovate the way universities, healthcare institutions, government organizations, and private firms manage the entire grant lifecycle process, covering conception, application, and evaluation. OmniGrants is not a part of a system; rather, it is a complete business tool which can handle not only the grant process but also research, development, and extension processes. OmniGrants is comprised of features and functionalities that organizations can configure to adapt to their own workflows. It is also built with a graphic workflow builder which permits them to create and design unique processes that help them achieve optimal compliance with regulatory requirements. The online grants management system has a technology which can be used for building smart forms. This intelligent smart form technology allows users to streamline the grant application process; eliminating data entry errors and data duplication, and at the same time, delivering a personalized experience for grant applicants. In order for organizations to ensure compliance throughout all stages of the grant lifecycle process, OmniGrants provides them with an audit log which can’t be tampered. The system is also built with an extensive and configurable notification component that improves the relaying of information between business users and parties, whether internal or external. As users communicate and exchange information, they will be able to collaborate effectively as well using the notification component. OmniGrants comes with reporting capabilities. Users can access all critical information they need from its dashboards. Moreover, the system allows them to create ad hoc reports and drill down into the specific data contained in the reports to gain detailed and better insights. Last but not least, OmniGrants supports integration with external systems which include FMIS, ORCID, and ABN. Transparency and accountability is one of the key features present in OmniGrants. The online grants management system has the capability to collect and consolidate information in one place, regardless of which stage of the grant lifecycle process the pieces of information are coming from. In fact, users can even combine disparate information together to facilitate decision-making. As they track information across the phases of the grant lifecycle process, the system permits them to also view all interactions and communications between all parties involved in each phase. Thus, they can see how researchers, staff, and stakeholders engage and exchange information with each other, thereby driving accountability. Advanced reporting is another feature included in OmniGrants. It has a customizable and configurable dashboard where users can access all the mission-critical data they need, helping them better evaluate the performance of their operations and activities. In addition, they can view built-in and predefined reports as well as create ad hoc reports. If they want to gain insights into specific or underlying data, they can use the system’s advanced search and filtering tools. With OmniGrants, organizations can set up an application process which is fast, personalized, and intelligent through the aid of its smart form technology. They can use this technology to build online grant application forms that can be added to the different stages of the entire grant application process. The smart form technology has a prepopulate feature. How does this feature work? It automatically captures data and information that were entered into the forms from the previous stages of the application process and inputs them into the forms that applicants need to accomplish in the subsequent stages. In other words, grantseekers or applicants no longer need to enter the same information all over again, making the application process fast and easy. In OmniGrants, after grantseekers or applicants submit their application, they will able to track its status and determine what actions have been made so far for that application. Once the grant application is approved and funding is awarded, the system lets them view specific details about the funding as well as the corresponding obligations. The online grants management system offers a superior relationship management feature. In this feature, institutions, researchers, and persons involved in the grant lifecycle can be classified into different categories. As a result, users are ensured that they are able to deliver the right message and information to the right contact or audience. 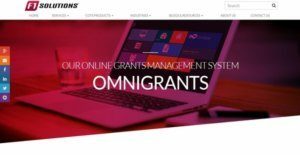 OmniGrants is built with an offline forms capability wherein forms such as grant forms, progress reports, and final reports can still be downloaded and filled out with information even if there is no Internet connection at the moment. Once the device reconnects to the Internet, the pieces of information are updated and synchronized across the forms or reports online. Compliance is one of the main reasons why OmniGrants was developed. The system allows users to always see to it that they are adhering to the requirements being enforced by legislative bodies and regulatory agencies, giving them the ability to validate and prove that grant funds are being used properly based on the limits and requirements set by the organization and authorities as well as confidently execute grant management activities. To attain this, the grants management system provides a complete and tamper-proof audit log of all records, contracts, projects, grant applications, evaluations, and more. Effective communication and collaboration is enabled in OmniGrants. Communication with personnel, applicants, and stakeholders can be done from a central area. Moreover, OmniGrants has an email and notification component or framework which allows the sending of emails and newsletters to internal and external users. Multiple emails and newsletters can also send in bulk. To wrap it up, OmniGrants automates tasks and improves efficiencies by integrating with third-party systems and services like SharePoint, TRIM, MYOB, QuickBooks, FMIS, ORCID, and ABN. If you are interested in OmniGrants it may also be sensible to analyze other subcategories of Best Grant Management Software gathered in our database of SaaS software reviews. Organizations have diverse wants and requirements and no software platform can be perfect in such a condition. It is futile to try to find an ideal out-of-the-box software product that fulfills all your business requirements. The smart thing to do would be to customize the application for your specific wants, worker skill levels, budget, and other aspects. For these reasons, do not rush and subscribe to well-publicized popular systems. Though these may be widely used, they may not be the perfect fit for your specific wants. Do your research, look into each short-listed platform in detail, read a few OmniGrants reviews, call the seller for explanations, and finally choose the product that presents what you require. How Much Does OmniGrants Cost? OmniGrants’ provides a single enterprise plan which you can avail through an all-in monthly subscription which includes secure cloud hosting, license, free upgrades, support, and maintenance. Please contact the vendor for more details, and request for a quote. We realize that when you make a decision to buy Grant Management Software it’s important not only to see how experts evaluate it in their reviews, but also to find out if the real people and companies that buy it are actually satisfied with the product. That’s why we’ve created our behavior-based Customer Satisfaction Algorithm™ that gathers customer reviews, comments and OmniGrants reviews across a wide range of social media sites. The data is then presented in an easy to digest form showing how many people had positive and negative experience with OmniGrants. With that information at hand you should be equipped to make an informed buying decision that you won’t regret. What are OmniGrants pricing details? What integrations are available for OmniGrants? If you need more information about OmniGrants or you simply have a question let us know what you need and we’ll forward your request directly to the vendor.